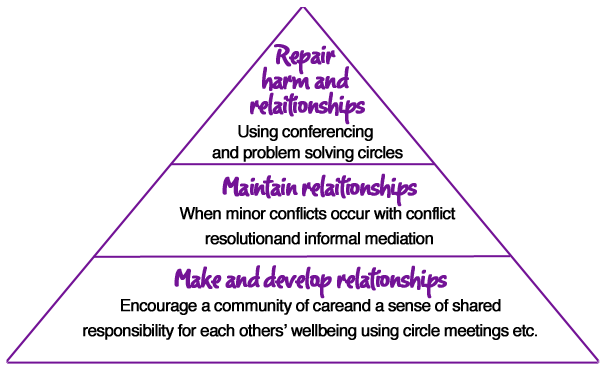 Restorative Approaches provides an underpinning ethos and philosophy for making, maintaining and repairing relationships and for fostering a sense of social responsibility and shared accountability. There are many challenges in implementing an organisation or institution-wide approach since the restorative way challenges deeply-held notions about power and control and the urge to make things unpleasant for someone when they have done something wrong or ‘misbehaved’. If conflicts and challenges are dealt with in a way that needs are met, then those involved can repair the damage done to their connections with the others involved and even build connections where there were none previously. They feel fairly treated and respected, since they have been trusted to find solutions for themselves and put things right in their own way. Because they have been listened to, people in conflict are more ready to listen to others’ perspectives and emotional responses, and so empathy is developed. This can change the choices made in future situations, as mutual respect and consideration develop. 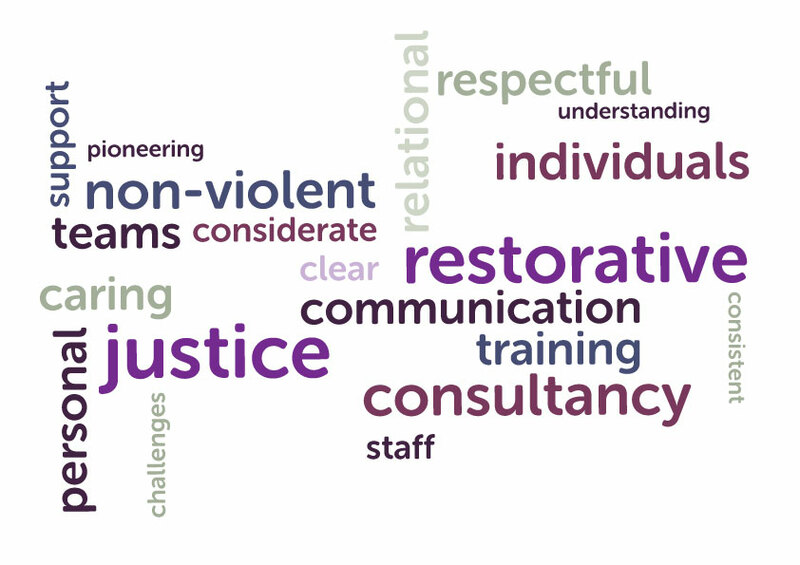 We encourage schools to consider Restorative Approaches and Practices as pieces of a jigsaw, which, put together, create a congruent whole school approach to relationship building and conflict management. We offer support and advice on integrating these elements into a school development plan. We also offer modular training which encompasses all of the above elements. Over the next few months we will be bringing our jigsaw pieces more in line with the Restorative Justice Council new Quality Mark so keep visiting our website to find out more. Environments that have had most success in the implementation of a restorative approach are those that have seen it as part of an ongoing plan to develop relationship skills, emotional literacy, health and wellbeing and distributed leadership opportunities. In educational environments, this also includes participatory and collaborative teaching and learning and peer support. 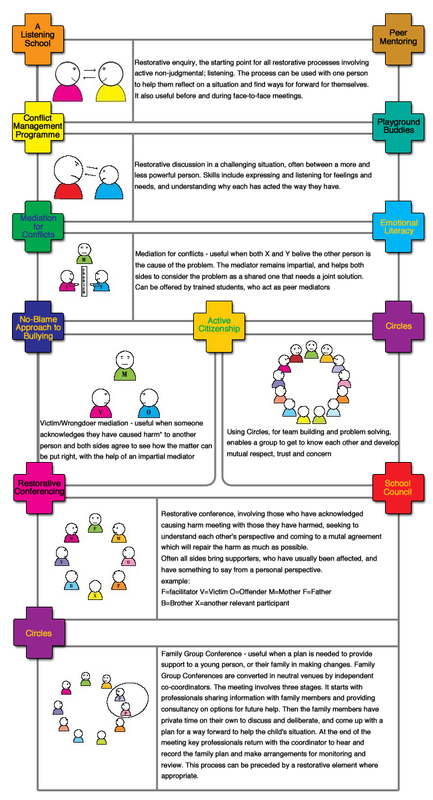 By seeking to build cohesive, compassionate communities wherever people live and work together, restorative approaches also address community cohesion in practical and pragmatic ways. Many people like to think of an institution-wide restorative approach in terms of a 3-tiered model based on a public health model, as first developed by Brenda Morrison building on the work of John Braithwaite. The health model is built on a community-wide strategy for maintaining health and wellbeing and developing preventative strategies; it offers targeted support as needed and focussed acute interventions for serious and emergency cases.